Do you need your old carpeting replaced? 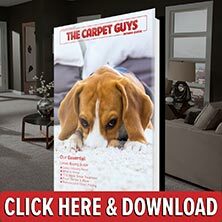 Book a free carpet installation estimate with The Carpet Guys and renovate your floors right away. For over thirty years, we have been providing the best quality flooring products to our customers, and we will do the same for you. As the best carpet dealer in Pittsfield, we have what it takes to install your carpeting correctly. Get a free in-home estimate scheduled with The Carpet Guys today. By installing new carpet, you add a sense of warmth and comfort to your home that no other flooring can provide. No matter what type of carpeting you are looking for, we can get you what you need. Plush Carpet – Whether you’re looking a sophisticated looking carpet or something comfy to lay down on, plush is the perfect fit. Get this rich and luxurious carpeting installed in your home. Frieze Carpet – People enjoy our frieze carpeting for the flair and off-the-cuff look it provides. For any informal setting, this casual looking style will be the best pick. Berber Carpet – If your home experiences a lot of foot traffic, you need to get our berber carpeting installed. It’s durable and will last for a long time. Looped Carpet – Our looped styled carpeting comes in many different colors and patterns. Add a little extra interest underfoot with our multi-leveled looped style. Get your new floors installed by the best place to buy carpet in Pittsfield today. Fill out your free estimate to get started right away.